Memorial Day weekend was awesome! My parents came home to visit and I wish they could have stayed longer :( While they were home, my mom taught me how to crochet. My mom is the master crocheter! She can whip up a blanket on a road trip to Florida and be finished by the time we get there. Trust me, I have seen her do it! 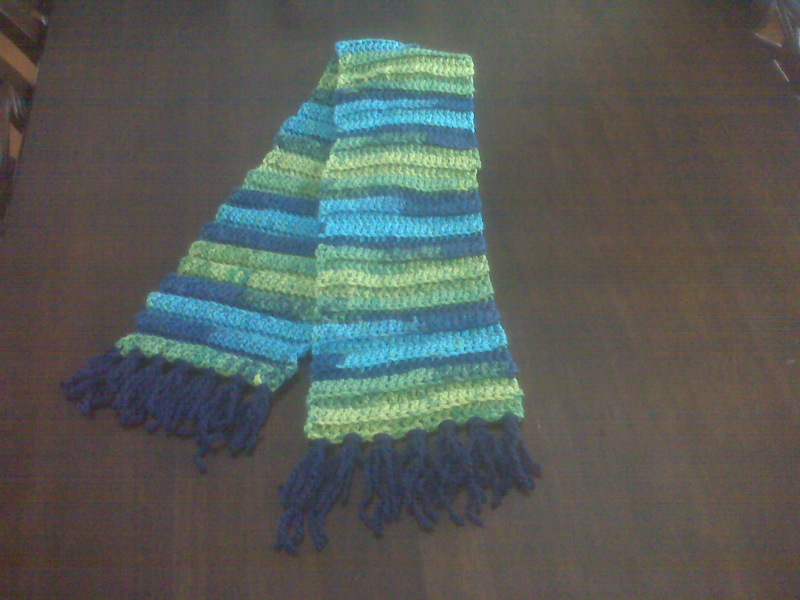 So, I chose to do a scarf as my first project. So, my holiday weekend consisted of bar-b-que'ing and laying out at the pool crocheting my scarf. I double crocheted, 23 in a row. I used a 10 1/2 crochet hook. The yarn was Loops & Threads Charisma in the color - 18 Sunny Day. For the fringe I used the same brand of yarn in the color - 7 Dk. Blue. I put 7 of those on. That was very fun to do and it was very meditating at the same time.